Similar in feel to Cherry MX Browns, Greetechs offer a keystroke smoothness on par or better than their Cherry counterparts. Amazingly better than Cherry browns, though still not quite in the league of crisp, clean Gateron brown tactility. 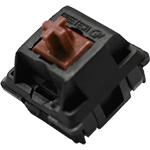 Have experience using Greetech Brown switches? Add a review to share your knowledge with the keyboard community.